More of the same images that were sent yesterday. The SSTV system seems to have developed a new issue with reports of "beeping" during the experiment. Unkown source of this but it is being passed through the radio system and is not from another source. The experiment is now concluded and the system has turned off. Packet should resume after Doug Wheelock uses the radio. These images were received today and were in Martin1 mode. 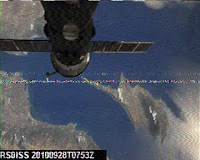 The graphic photo (first image) was received by PDØRKC during the 0930 UTC pass over Europe and the image of the Russian spacecraft over the coast was received by F1TWT during the 0750 UTC pass over Europe. Seems a few images were transmitted beyond the Russia region as a report from Australia was also received. Another opportunity is scheduled for tomorrow (Sept 29). No reports from ground stations but the activity was indicated as executed. I suspect they may have had hardware issues since packet was off during most of the planned time for today's experiment. Let's hope they have better luck tomorrow. Looks like the Russians are scheduling another run of the MAI-75 experiment for Sep 27-29. The activity is planned for 2 runs a day over Western Russian roughly between 0700-1100 UTC. No additional details at this time but likely to be a repeat of the earlier September session. Reports that SSTV was again active today during the 11:15, 13:00 and 14:45 UTC passes over Europe. Seems that the imagery is only being downlinked over Russia and is the same file shots sent in previous sessions. The system is planned to be powered off and switched to packet about 1600 UTC. Seems we had limited activity today following the school contact with Australia (via Argentina). First images were received around 1200 GMT over Europe and a second set received at 1400 GMT over Europe. The crew timeline indicates the experiment shall be powered off after the 1400 GMT pass today and info from the http://www.ariss.net/ site indicates the system has been restored to packet operations. Russian experiment MAI-75 SSTV activity delayed to Sept. 14 and 15. Activity should still be around 12:00-16:00 UTC each day. The system being planned for use is the Space Cam SSTV system that sends stored images so folks in darkness will have a chance to caputure images. The expected mode will be Martin 1. Most of the activity is directed towards Moscow but the system is sometimes left on between passes over Russia. Previews of the crew schedule indicate that SSTV will be activated by the Russian crew on Sept 13 and 14. The activity should begin about 1200 GMT and conclude about 1600 GMT on both days. Additional details as they become available. Reports indicate that stock images similar to the ones sent yesterday were again received between 11:45 and 13:30 UTC. This session of the MAI-75 experiment has concluded with numerous images uploaded to the gallery. Take a look at the best of each image over the 2 day period at http://www.amsat.org/amsat/ariss/SSTV/index.php or look at all the submissions starting with the most recent at http://www.amsat.org/amsat/ariss/SSTV/archive.php. Thanks for all the captured images being uploaded. Here is a new Earth view image caputured by 9W6ZUL. Seems some old and new images are in the folder being transmitted. Images were received during the entire orbit today but some reports of constant carrier between images were also reported. 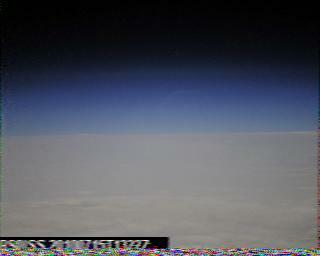 First SSTV images received (on 145.800) just before 13:00 UTC today as the ISS passed over Europe. Images have been reported over Asia as well so it appears the system is in auto mode for the entire orbit. Images were the same as transmitted about 2 months ago. Unknown at this time if any new images have been added to the rotation. An activity to support SSTV activation (MAI-75) has been schedule on July 15 and 16. Times fall between 12:00-15:00 UTC on the 15th and 10:00-12:00 UTC on the 16th . The system will be operating space cam in slide show mode and is expected to use the Martin 1 format. The times are just over 1 orbit each day (two passes over Moscow) so opportunities will be very limited. This image from PS8RF and many other different views were received today from the ISS. The images were sent in the Martin1 format and using the SpaceCam computer based system. Each of the images transmitted today were preloaded into a library and sent in a slide show sequence. Seems the DATA connector on the front of the D700 is not seating properly with the cable from the VC-H1. Crew heard talking to MCC-Moscow about the problem. Several reports of carrier with no modulation when ISS in range of Moscow but no successful reports of image transmissions. 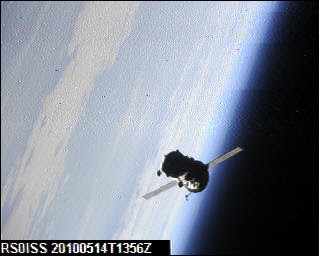 Tomorrow the crew will switch to the SpaceCam computer based system and attempt to transmit Martin-1 images but the connector port on the radio could still present a problem even though that system uses a differnet cable. Seems the team at MAI will be at it again on May 13-14. 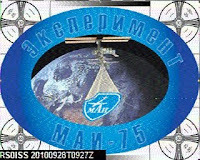 SSTV images will be transmitted while the ISS is in range of Moscow but may also be transmitted throughout a few orbits that pass over other parts of the world. Transmission times should be about 1300 UTC-1700 UTC each day. Transmission types will likely be Robot 36 for part of the time and Martin-1 for the remainder. Listen on 145.800 MHz and good luck. A bit more info to share. The Wed (Jan 27) operations will be conducted using the VC-H1 in automatic mode which means Robot-36 mode images being transmitted once every 3 minutes on 145.80 MHz. This should occur worldwide during the time frame of 0900-1400 UTC. The operations on Thursday and Friday (Jan 28-29) will be in mode PD-160 using MMSSTV and will occur when the ISS is in proximity of western Russia. Looks like some more SSTV activity planned for Jan 27-29 around the hours of 0900-1300 GMT. Limited details at this time.